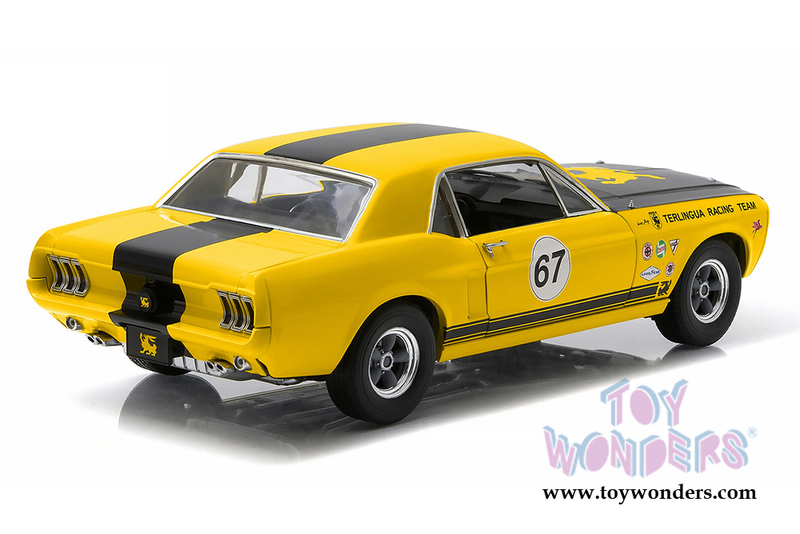 12934 Greenlight Racing Tribute - 1967 Terlingua Continuation Mustang Hardtop #67. 1:18 scale diecast collectible model car. This Ford Mustang is a 10"L x 3.5"W x 2.75"H diecast collection car with openable doors, hood, trunk, and detailed engine. Limited Edition. Sponsors include Komi, Good Year, Castrol, Autolite and more. This 1967 Mustang is manufactured by Green Light. Item 12934 is in YELLOW color with Black stripes & Black hood. Individually packed in a window box. Box size: 13.25"L x 6.25"W x 5"H.
Originally created in the mid-1960's for a 200,000 acre ranch, the Terlingua Racing Team logo is certainly one of a kind. Carroll Shelby said, "You know, it would be kinda neat to use this as a racing team logo too!" Shelby was developing the GT350-R at the time, and brought the first car to Green Valley Raceway near Dallas on February 14, 1965. Ken Miles drove the newly branded car, designated SR002. It was white with blue stripes and the first "R" model Shelby Mustang ever race. The SR002 won the race that day, and the Terlingua Racing Team logo was later used on the 1967 Jerry Titus car, which raced in the Trans-Am series. Shelby wanted to use colors that would make the car different and show up really well on the Trans-Am grid. Shelby's designer Bill Neale, immediately thought of yellow and black to represent their team and the city in which it was born. The bold color palette gave the Terlingua Racing Team one of the more popular and more recognizable cars of the day. To see more Greenlight collector die-cast models (click here).